On Scene: Got a giftcard? We'll help you spend it. Got a giftcard? We'll help you spend it. 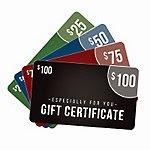 By now those gift cards you received for Christmas have got to be burning a hole in your pocket! Maybe you've been saving for that special leather helmet all year long, and you'll finally take the splurge now. Or perhaps you really don't know what to spend it on. Well, we'll help you figure that. Because we've got lots of great items that anyone would love. One of our biggest selling categories on our site is our Flashlights section. We've got an array of amazing lights from different manufactures that are good (no, GREAT) for the firefighter, or for the everyday light you like to keep on backup in your house. Check out our awesome flashlights here. More of a tool person? Don't worry, we've got tools for days under our Tools Category on our site, too. Tools for the firefighter, tools for the guy who just likes to have a stocked garage. Tools that will help you out of a tricky situation, and tools just to help with simple tasks around the home. We've got awesome bags and packs. Bags that are big enough to fit all your turnout gear and tools, and bags that are meant to throw on as a backpack. We've got bags packed with tools and supplies already, and bags that are just waiting to be filled with all your essential rescue items. Our boot supply is endless---with options ranging from 14" structural firefighting boots to everyday boots that will just keep your feet warm while at the station. With name brands from those you trust, like Reebok, Globe, Honeywell and Haix, we're sure to have a boot that will fit with ease and comfort. If you're more of the grazing-type, check out our hot sales & specials to see how many things you can get with your gift card at a steal of a price! Products ranging from knives to socks to decals and more! No matter how you choose to use your gift card, we know you won't be disappointed.